I spent the week at AWS re-Invent 2018 with the tens of thousands other IoT pilgrims. Once again Amazon wowed attendees with a raft of new services and announcements for both enterprise AWS services and AWS IoT. 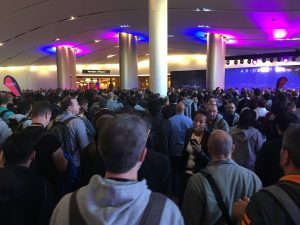 This was my second consecutive AWS re-Invent so I felt a little more comfortable with the crowds and was a little more efficient in my navigation of the breakouts, keynotes, demos, and array of networking events. My perception of the crowd this year was a little different. Last year I felt most were just there to drink at the well of AWS and the Internet of Things. Most questions were somewhat academic or just inquisitive. I have three quick take-aways from this year’s conference. Transient Data: IoT data is clearly flowing and people are now moving to the more practical reality of turning data into action. One AWS partner manager told me they now predict that within three years 90% of this IoT will be transient, i.e. it will not get stored in the cloud. The interesting thing about this statement is that it moves the structure of the IoT edge back to the days of analog controls where there is no digital signal and all actions are taken at a point in time with real-time analytics. AWS is supporting this notion with Greengrass, IoT Events, and other streaming services that can deploy analytics and responses either from the cloud or at the edge depending upon the latency requirements of the application. It was clear to me that the AWS team now understands industrial applications at the level of Programmable Logic Controllers. Rapid Innovation: AWS has not moved past last year’s impatience with those of us who work at the edge. Everything they do supports getting data to the cloud and then taking action, using AWS services, from the cloud. Even services like Greengrass which enable services at the edge, come from the cloud. IoT integrators have to pay attention to Amazon Web Service’s rapid release cycle of new services, as each of these is basically a new tool for stack integration. Enterprise software companies have to pay attention because the scale of these tools and the inclusion this year of state machine logic with IoT Events, and diverse sensor data aggregation with IoT Sitewise, provides individual operations teams with the tools to build their own custom enterprise applications entirely in the cloud with AWS. Factory automation and ERP platform companies should be aware. Retrofit: Finally, like Intel first noted in 2013 when I heard one VP say “85% of all industrial equipment is not connected and will not turnover (i.e. be replaced) for more than 10 years,” the AWS IoT team now understands that IoT is a retrofit market. Perhaps the best example was AWS IoT VP Dirk Didascalou’s keynote presentation of IoT Leadership. He invited Eric Loes, Vizio VP of Software Engineering, to present how Vizio used AWS IoT tools to upgrade over 4 million Vizio TVs with Alexa services – 4 million installed and new TVs. Vizio used AWS IoT services to retrofit their hardware with new capabilities. Didascalou then pivoted to [x]cube who is retrofitting hardware on thousands of cell tower fuel tank systems to provide early warning to low fuel conditions. Scale in the IoT is not limited to new, consumer offerings and this year AWS IoT put it front and center. The time for exploration of the IoT is over. AWS re:Invent 2018 demonstrated that both the technology stack and the customers are moving into deployment. >>> Learn about Digi Edge Intelligence via IoT Connectivity with AWS, or contact us to discuss your needs.